A cool breeze danced through a crowd of about 150 people as the sun set in Birmingham tonight. People of many faiths gathered to stand in solidarity with those in Charlottesville, Va., a city that was recently descended upon by throngs of violent alt-right groups and ended with many injuries and one death. Tell me what America looks like? Is there such a thing as being too southern? We went back and forth, trying to figure out where to go. We love Sitar and it’s yummy naan, but we’ve been there a bunch. Yo’ Mama’s and it’s chicken and waffles is a party on the tongue, but is always crowded. We thought about El Barrio, our ALL-TIME FAVORITE, but we wanted to expand our culinary repertoire. So, we headed toward Uptown. We pulled onto Richard Arrington Jr. Blvd. and looked at the logos outside the newly-minted brick restaurants: Texas De Brazil (delish, but too pricey for lunch)… Mugshots (we’re taking a break from beef)… Southern Kitchen Birmingham… (Hmm). I heard a lot about Southern Kitchen, have seen Facebook posts of folks smiling on its patio and checking in during the happy hour. Plus, I read somewhere that Garth Brooks ate there when he was in town for a concert. If it’s good enough for Garth, surely it’s good enough for me. We decided to give it a try. We found a parking space right across the street. YES!!! This was shaping up to being a great lunch date. We walked inside and braced ourselves for some southern cuisine. The place wasn’t too packed. It had a minimalistic decor with its metal chairs and gray walls. The mood was chill and we sat down ready for lunch. “Do you see this,” he said, and pointed out the $8 cheddar cheese blend. I contorted my face. I thought it was annoying, too, but blew it off and went back to plotting which dressing would top my Bayou bliss. It was too late, though. Although he hadn’t sampled it, that menu item had put a bad taste in my husband’s mouth (no pun intended). He grabbed his car keys, stood up and motioned for me to join him as we headed toward the door. We hadn’t even gotten our complimentary glass of water yet. At first I thought he was overreacting. I want my Bayou Salad, man! What is the waiter going to think? The salad has smoked bacon! Hubby wasn’t having it. We politely excused ourselves and walked next door to Cantina Laredo. We munched on chips and salsa, ordered the chimichangas and had a discussion about cultural sensitivity. Plantation. 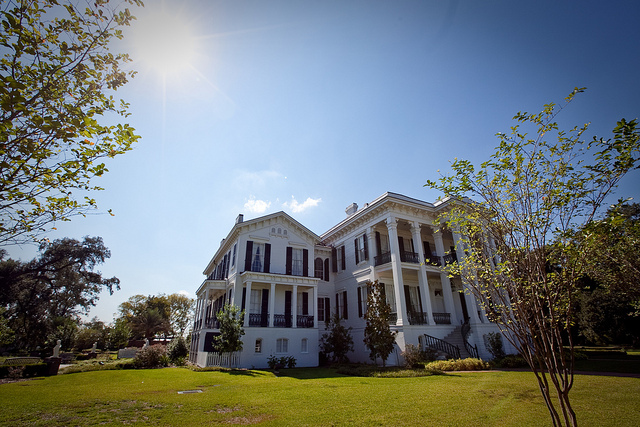 When I think about a plantation, I think about a large, usually white, house with plentiful food, warm beds and well-dressed slave owners, while outside were shacks inhabited by African-Americans who worked sun up to sun down, ate scraps and lived in fear of being lynched. The last thing I think about is pimento cheese. A plantation, for me, symbolizes oppression. The word is grating on my nerves. I don’t think of genteel southerners sipping sweet iced tea and saying “y’all.” I think of people who look like me wishing for the freedom of death because the thought of living outside of chains was unimaginable. What do you think? Is naming something after a “plantation” offensive? Is it comparable to calling something (fill in the blank with some other symbol of racial oppression) chicken salad? Don’t get me wrong, I do not believe the folks at Southern Kitchen are trying to hurt African Americans with their pimento cheese!!! I am sure they were simply making a play on words, just like their Charleston cheese dip, Savannah salad, Red Mountain chicken and dumplings, or The Jefferson large plate. For me, though, a plantation would be the last place I’d think of as a humble abode. What do you get when you gather people of all ages, backgrounds and skin tones to talk about the racial climate in Birmingham? Sadly, you get not much more than good intentions. 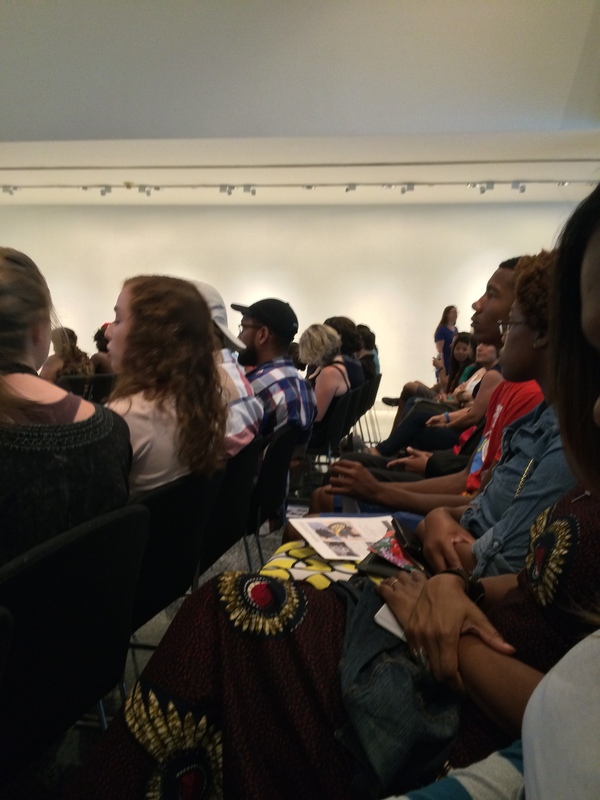 I went to the Birmingham Museum of Art Friday night hoping to hear locals talk about race and maybe come away inspired and educated. 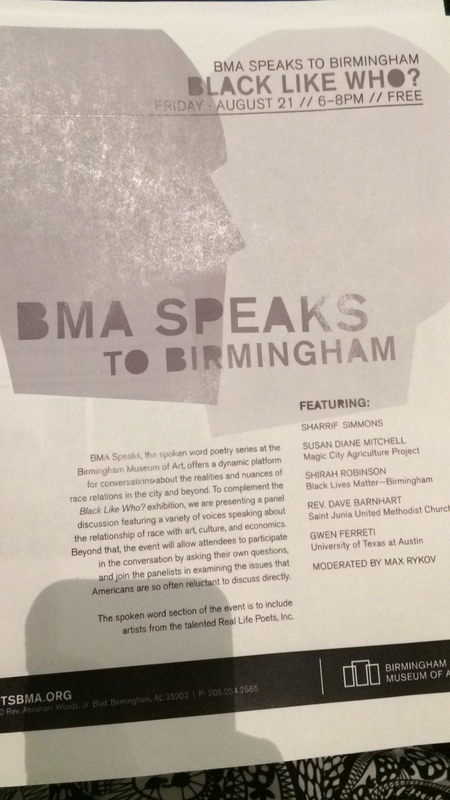 I was attracted to the event’s title, “BMA Speaks to Birmingham: Black Like Who?” and was proud that the museum was leading this conversation. I have been to more events like this than I can count, and each time I hope that we will all leave with our arms locked and singing “Kum ba yah.” Each time, however, that’s not the case. I climbed the museum’s gorgeous marble stairwell, passed the closed cafe with its sleek white sofas and lime-and-white table and chairs, sauntered along the hallway decorated with iconic civil rights images, walked into the event area and was pleasantly surprised – blown away, even. Sitting, standing and chatting in the room were a number of brown women with cottony afros; petite, perfectly dressed old, white ladies; bright-eyed, curious teenagers; dapper professionals with funky eyeglasses; the whole gamut of tall, skinny, bald, brown, beige and black. This was different than anything I had experienced. Usually at those “let’s talk about race” events, it’s a mostly black crowd of folks who are preaching to the choir, or a slightly mixed crowd who are too polite to push the issue properly. My hope continued to build. After podium pleasantries and introductions, two poets walked to the front. The black men tag teamed each other in verse, talking in an engaging, rhythmic tone about the oppression of African Americans. Their voices rose and fell as the words flowed, peppered with powerful images of struggle in this day and age where blacks are gunned down. I didn’t know how to feel. I, too, have questioned God’s plan in the role of the black man’s story. I, too, have grappled with trying not to assume a whole race of people are the same. One of tragedies of racism, I believe, is that it seems to have caused some people to reject Christianity because it is the “white man’s religion.” That is a travesty. We rob ourselves of what I believe is the only hope we have for healing – Christ. After hearing the last poet’s words, though powerful, I could not help but wonder if it would prohibit an environment where transparent conversations could be had by all. Some of my people would probably say to that, “Who cares?” But, if you want to have a two-sided conversation you have to consider your audience. You have to. Then the panelists came onto the stage. Susan Diane Mitchell, of the Magic City Agriculture Project, was soft-spoken (almost to the point of speaking in a whisper). She talked to the audience about the importance of the woman’s role in today’s justice movement and did so like a mother gently instructing her young. The event’s co-host, poet Sharrif Simmons told his story of being raised in Ethiopia where his “oppressor” did not have white skin, but looked like him. He spoke of how racial identity can be the result of your environment, and how when he moved back to America he had to shift how he saw himself and others. Gwen Ferreti, a professor at the University of Texas at Austin, shed tears as she shouted that black lives (and brown lives) matter and talked about her Latino brothers and sisters who share in the struggle to be seen as worthy to breathe air. The very beautiful Shirah Robinson of Black Lives Matter Birmingham, with her flawless nutmeg skin and dark painted lips, spoke of wanting to create a world like the one that exists in her dreams instead of the nightmare she lives every day. Rev. Dave Barnhart, of Saint Junia United Methodist Church, said that the real sin our society commits is creating a world where a little black girl sees herself as inferior. Things were going well, but then, the floor was opened for questions. An audience member stood and said that there should have been a “street brother” on the panel to give credibility to the discussion. He had a tense exchange with the sole black man on the stage. It was uncomfortable. It wasn’t fruitful. It was a distraction. But it was familiar. I’ve seen scenes like that before at other conversations about race. 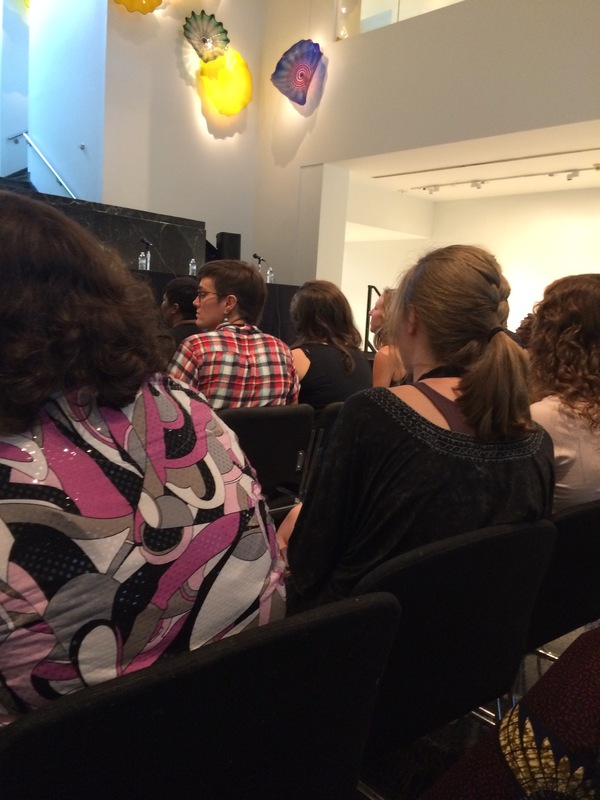 Audience members began to speak. Some tried to be the voice of reason. Others asked questions that diverted to other issues. The line of people who wanted to comment began to grow. A lot of people had something they wanted to say. That, too, was familiar. When the soundbites ran into each other I began to tune out. Eventually, I just got up and walked away. Did the attendees, did I, expect one of the panelists or audience members to have some answer, some solution to our race problem? Maybe I did. Foolishly so. Truth is, we are hungry for conversation. We are starving for community. But, I panels like these are quite common. And, at many of them, I have seen the same folks who were there last night. Insanity is defined as doing the same thing over and over again and expecting different results, right. So, are we insane? I applaud the museum and its organizers for the attempt. Sadly, though, the race discussion is so complex that it would take a million intentional, concerted efforts to make a tiny dent. And, more importantly, it is going to take something greater than ourselves. It will take the one who created us, the lover of all men: Jesus Christ.